This article was originally posted on Startup Rocket here, and written by Will Little and Troy Henikoff. In the first two posts in this series, we examined why building a financial model for your startup is important and how to practically get started with your assumptions tab. Today, we’ll continue by diving into the income statement and supporting tabs used to calculate your projected revenue and expenses. We’ll discuss these types of learning nuances in more detail in our next (and final) post in this series. But first, we have some work to do in order to fill out the model. Copy that formula in D2 and paste it into the next 58 columns in row 2 in order to set up 60 months (i.e. 5 years). Next, we’ll focus on revenue. Starting in row 4 you’ll want to list the high-level revenue streams for your business. We’ll write these in cells B4-B7, and in order to begin filling in cells C4-C7, we’ll need to ask ourselves how will we calculate our forecasted revenue for month one. This, as you may suspect, requires starting a new tab. 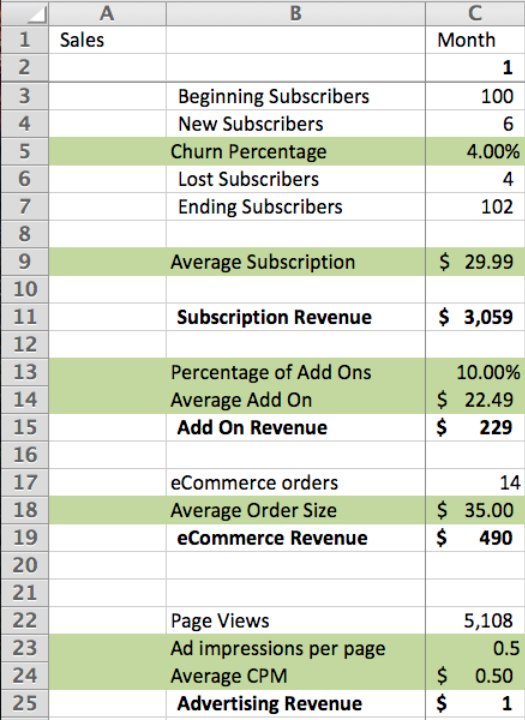 Note that we are using the necessary sub-rows to calculate the total for each revenue stream per month (i.e. rows 11, 15, 19, and 25). From top to bottom in month 1 (i.e. column C), you’ll want to start with your actual numbers (or assumptions if you don’t have numbers yet) and fill in each cell appropriately with formulas using your assumptions, and – you guessed it – any additional custom detail tabs you need. Right out of the gate here with our example business, in order to calculate the number of New Subscribers in month 1 (i.e. cell C4), we’re going to need to create another custom tab around traffic numbers to handle this calculation. 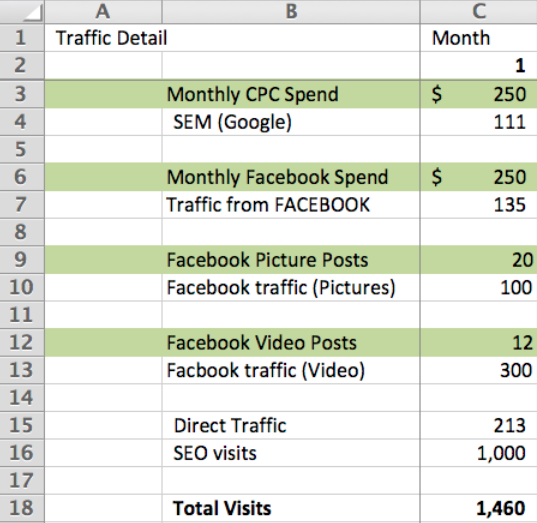 In order to calculate the number of new subscribers in month one, we’re going to need to add up anticipated traffic numbers from paid search (SEM), organic search, Facebook, direct, etc… (i.e. it will, again, be custom for your business). Importantly, after a few months of testing, we’ll assume in this model that we’ll get to SteadyStateMonthlySEMSpend (i.e. $10k) and also apply that to our Facebook channel (see G3/H3, and G6/H6). This, for the purposes of our demo model, will then carry forward through our 60 months. Now that we have our Traffic Detail filled out, we can go back to our Sales Detail and finally fill out C4 there (i.e. New Subscribers). …which will then be applied to the rest of row 4 and allow us to, using the proper assumption values, calculate our Lost/Ending Subscribers and ultimately our Subscription Revenue, which is what is then rolled up to our Monthly Income Statement for the C4 cell that started us down this rabbit trail to begin with. The other revenue stream totals can then be calculated similarly from our traffic detail tab and assumption values, which allows us to calculate Gross Revenue numbers on our income statement. And there we have it. Copy the formulas across the 60 columns and total them up into your Gross Revenue row. Now we can turn our gaze to costs. The bottom rows of the Income Statement will then examine the costs associated with running our business, and – similar to how we worked it for revenue – we’ll need to create custom tabs when appropriate. Note the formula for C11, which adds our assumed base cost to a scale factor applied to our traffic that we pull in from our Traffic Detail page. Our Subscription and eCommerce values are then calculated from our SubscriptionMargin and eCommerceMarginassumptions. We can continue then by tallying our Gross Profit (i.e. C8 minus C14), add in our direct costs from Google and Facebook ads (pulled in from the Traffic Detail tab), and calculate our Contribution Margin (i.e. revenue minus direct costs). Since these costs are calculated from the number of employees we expect to have, and the details of their salaries and benefits/taxes, this warrants the creation of a new tab. In other words, as sales increase, we’ll add warehouse help based on our assumed OrdersPerWarehouseHelpPerson value. With our current assumption values, this starts to increment in month 22, but you can see how if things pick up, we’ll need to hire this person earlier. For those unfamiliar with the term, EBITDA stands for Earnings before interest, taxes, and amortization, which is a sufficient number to end with here for financial modeling purposes. We’ll of course provide a link to the full demo spreadsheet at the end of this series. While you can (and should) study other financial models to use as additional guides, it’s critically important for you to understand the principles behind what is going on here. In short, start with the Monthly Income Statement and then go row-by-row, cell-by-cell and create custom detail tabs (and custom sub-detail tabs) as needed to perform the necessary calculations to keep your income statement clean.